Early in the night, Johnny Brenda’s was full of loyal West Philadelphia fans in support of local singer/songwriter Annie Sachs (a.k.a. Tickley Feather). Sachs was joined onstage by a keyboardist and another band member manning the synths and pedals on the floor, and she opened by addressing the crowd: “These are my male models … they’re expensive.” Sachs spoke sweetly throughout her performance, thanking friends and fans for joining her for the night. The heartwarming display epitomized Tickley Feather’s captivating presence and music. Under dim lighting, the smoke machines wafted vapor trails through Sachs’ long hair to fit the eerie, minimalist vocals that are layered throughout her songs. At one point, she held up a small stuffed bird and squeezed it into the microphone, harmonizing with the toy’s tweets. Her mesmerizing set put the audience in a trance that was broken only by the gentle beats of a drum machine. Cass McCombs’ bandmates have changed so frequently that it’s difficult to keep track, but a bassist and drummer joined the Baltimore native for the night. It’s rare that a drummer can appropriately control his volume and still deliver a concrete beat; it was refreshing to see an intense percussionist who didn’t overpower the rest of the band. McCombs was all over the stylistic spectrum, from metronomic math-rock beats to Beach Boys melodies and twanging, ’50s-era rock ’n’ roll guitars. McCombs came across as a young, sweet-tempered Lou Barlow. By the time Beach House’s Victoria Legrand and Alex Scally went onstage, everyone in the crowd seemed to be a drink or two deep and in great spirits. 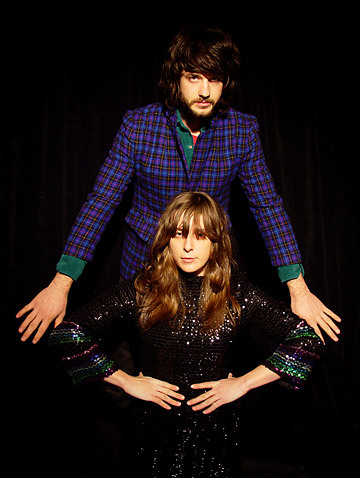 In the past, Beach House’s live sound had been limited by its two-member lineup, but with the addition of a drummer for this show, the group expanded its ability to create music that could reach any audience. As with Tickley Feather’s set, the lighting played a crucial role: The band was obscured in a green haze as the audience became spellbound by Legrand’s ghostly vocals. Beach House played material from both the new Devotion and its 2006 self-titled debut, including “Childhood,” “Master Of None” and “Heart Of Chambers.” But when Devotion single “Gila” was played, the room grew respectively quiet. Even with an encore, the night seemed to end too soon.